The Kitchen Sisters (Davia Nelson & Nikki Silva) are award winning NPR documentary producers who have been working together for more than twenty-five years. They are the creators of the Hidden KitchensLost & Found Sound and the post 9-11 Sonic Memorial Project, co-produced with colleague, Jay Allison. As independent producers, they are the creators of more than 200 stories for public broadcast about the lives, histories, art and rituals of people who have shaped our diverse cultural heritage. They are the authors of Hidden Kitchens, Stories, Recipes and More from NPR’s The Kitchen Sisters, a 2005 New York Times Notable Book and a James Beard nominee and Hidden Kitchens Texas. The Kitchen Sisters Productions, non-profit organization, is dedicated to exploring complex cultural issues through personal stories, bringing seldom heard voices to air, and building community through storytelling. Visit their website for more. Nathan Dalton, Associate Producer and Project Manager, began working with the Sisters in 2006. He spent much of his youth touring the country and playing music with a variety of bands, but these days can usually be found haunting the farmer’s markets and shuffling through the library stacks of Berkeley, CA, where he lives with his family. Laura Folger, Associate Producer and Designer, began working with The Kitchen Sisters in 1999 at the beginning of Lost & Found Sound. As a longtime friend, she jumped on board to help launch the series and never looked back. She collaborates as series/story associate producer and as photographer and graphic designer for The Kitchen Sisters visual materials and online sites. 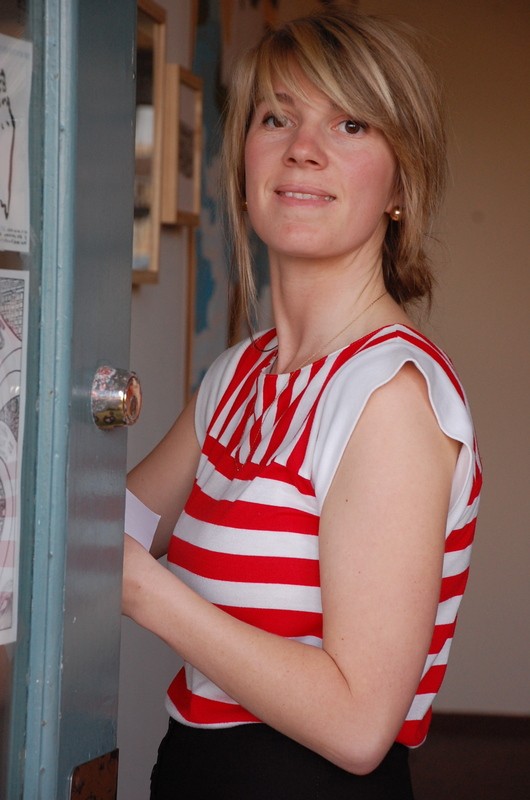 Thalia Gigerenzer started interning with the Kitchen Sisters in May 2011. Coming from a background in print journalism, she loves hunting for untold and offbeat stories. Thalia grew up in Berlin, Germany. After graduating from the University of Chicago, she spent a year in India on a Fulbright scholarship, where she documented the life stories of the residents of a poor, working-class neighborhood in Delhi. As a passionate documentarian of hidden histories, she’s very excited to be part of the Kitchen family. Rachel Scott is a native of Santa Cruz County and graduated from U.C. Santa Cruz with a degree in Sociology. She has been a part of the KZSC Santa Cruz community for over three years, where she has hosted a variety of music programs and served on the governing board. She is passionate about music, ethnic cuisine, traveling, and exploring socio-historical topics through film and radio. As the former guitarist in an all-female rock band, Rachel is thrilled to be part of a team that celebrates female culture and history. Sam Robinson graduated in July 2010 from the University of the Arts, London with a degree in Sound Art and Design. Sam aims to create work with a strong focus on composition, detail and clearly thought-out aesthetics. He has been writing an producing his own music for 13 years and in addition to live performances his sound work has been heard on BBC national radio and London art radio station Resonance FM. In summer 2010 he moved from his home in south London to San Francisco and has had the pleasure of working with the Kitchen Sisters. Matt Beagle started interning with the Kitchen Sisters in 2011. Before coming to the Kitchen, Matt worked as a labor organizer, a camp counselor and a producer for “White Collar Brawler,” an online documentary about boxing. In 2010, Matt participated in the Coro Fellows Program in Public Affairs, and wore a lot of ties. Matt is also a stand up comedian and can be seen telling jokes about his parents in local bars. Patty Fung, nicknamed the “roving eye” here at Kitchen Central, is a hobby photographer, documentarian, and explorer. Her personal work ranges from capturing the in betweens of the day to documenting the projects of non-profit organizations. She’s a Bay Area native and recent graduate from the University of California, Santa Cruz where she studied environmental studies and education. Other than tinkering with different mediums during her free time, she enjoys reading, crafting, and riding her skateboard all over the place. Photo by Kenny Srivijittakar. Tess Kenner graduated from U.C. Berkeley, where she studied History and Spanish. After graduation, she returned to her home town, Los Angeles, where she worked on the documentary film Food Inc., and on a documentary special about social networking. She spent several months in Rome, cooking at the American Academy’s Rome Sustainable Food Project. She joined the Kitchen Sisters in the summer of 2010. She loves being apart of Kitchen Central! Lacy Roberts is a budding radio producer from the Big Sky State of Montana. After graduating from Brown University, she relocated to the San Francisco Bay Area and was surprised to find that lemons could grow in her backyard. In January. Her work has been heard on YouthCast, a growing handful of quality NPR stations around the country, and her podcast, The Ladies Village Improvement Society. Though its currently on hiatus, you can hear episodes from the first season on lvisradio.org. She is now helping out in Kitchen Central with the Sisters’ upcoming series on young women around the world and working on some sound projects of her own. Surely more revelations await as the California seasons proceed… fig trees? quince? Who knew? Marie Doezema has been working as a print journalist for ten years in France, Japan, Qatar and the U.S. After graduating from Vassar College, Marie cut her teeth on a Paris-based literary journal while studying Arabic and working in a wine bar. Recent work has appeared in The Asahi Shimbun/International Herald Tribune, The New York Times, The Boston Globe, and Paris/LA. Eager to blend sound into her stories, Marie came to San Francisco in the summer of 2009 to learn from The Kitchen Sisters. In addition to writing, editing and radioing, Marie is at work on a collaborative photo-journalism project about global remittance workers. Lisa Morehouse came to radio after 14 years in public education, teaching English and journalism in rural Georgia and San Francisco, and learning from her students’ stories. Since 2007 she’s been writing about education (Edutopia, McSweeney’s) and producing radio stories. Her pieces on travelling Samoan circuses, butchery classes, and art in unlikely places have aired on shows like KQED’s The California Report and NPR’s All Things Considered. She feels lucky to be a line cook in the Kitchen.